I. A game that is short, has simple rules, an often humorous theme and lots of randomness. II. A term for describing games, in any given genre, that are the simplest and the most accessible. In the first sense, a Beer and Pretzels game relies more on social interactions and surprise than on competition and strategy. It is fun to play, requires little time and little attention. It is not a party game, but offers a good way of relaxing, chatting and laughing among friends. In the second sense, a Beer and Pretzels game does not have to be very short, random and simple — provided that it is more so than most other games in its class. This kind of Beer and Pretzels game is less a filler game than a gateway game to a given genre. The distinction between these two meanings does matter if you do not want to jump when hearing Axis & Allies Global, with its 1,018 pieces, its 4 full-size game boards and its average duration of 10 hours, called a Beer and Pretzels game. 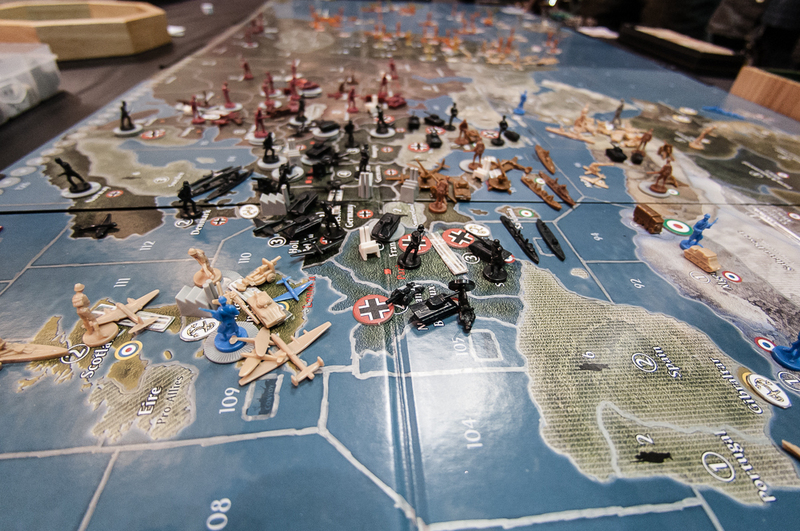 The thing is, for the wargame enthusiast, the grognard, who relishes hex and counter games and monster games, Axis & Allies is essentially a light-hearted dice-fest. Pretzels does not have to be taken as demeaning or dismissive. It was certainly not when first used, back in the 1970s, to distinguish, among the broad range of wargames produced by the Avalon Hill company, the games that were the most accessible, quick and exciting to play, like Afrika Korps, from more involved titles like PanzerBlitz. And obviously, when series such as Warhammer, Command and Colors or Memoir 44 are referred to as Beer and Pretzels games, it is for their high fun factor, introductory side more than because of their so-called “lack of seriousness”. Beyond these lofty considerations, the questions that popped into my mind were: Why beer? Why pretzels? Pretzels are less greasy than most snacks, so maybe that boosted their popularity among gamers. But the fact is that they are not among the most popular snack foods, according to many surveys such as this one. The quasi-alliteration is cute, but is that all? Well, we are told that it is the tradition, for bars as well as bowling alleys, to serve pretzels with beer (with the not so subtle aim of making patrons more thirsty). The fact is that beer and pretzels are an old couple. Centuries old. Well before bowling alleys. So old that we might never be able to determine which part of them came from Germany — but we do know that they met there. And raised a family that flourished throughout Europe for centuries. And they still occupy a prominent place in German culture and culinary know-how. This 12th-century painting of a banquet contains the earliest known depiction of a pretzel (click to enlarge). The origin of this braided bread is not clear. Evidence of its existence can be found down to the 12th century, in Alsace, but it is certainly much older. Many regional variants exist throughout Germany, and throughout its history. The word itself is of germanic origin. This small bread “having arms” (latin bracchiatus) was called brecedela in old German, then Prezel, or Brezel. A stamp celebrating the 450th anniversary of the Reinheitsgebot. Another word of Germanic origin (Bier), that West German monks borrowed, around the 6th c., from the Latin biber (beverage). It is Germanic tribes who introduced beer in Europe. And the German tradition that has developed it to a high level of perfection. But what can better illustrate the central role of beer in German culture than the existence of that German Beer Purity Law, which dictates the ingredients that beer must contain to be entitled to bear that name — as much as the fact that this law has remained practically unchanged and is still in force today, after more than 500 years? It is no surprise, then, that beer and pretzels have become the symbol of the most important beer festival in the world. Oktoberfest has been held in Munich, Germany, since the Middle Ages. And the 6 million liters of beer that are served there are accompanied by pretzels. You recognize this one, don’t you? I guess the point I want to make is that I find it quite appropriate that the expression Beer and Pretzels game uses two German specialties to qualify… a third one. The origins of pretzels and beer might be distant and obscure. But not those of the modern board game. It comes directly from Germany. And Germany continues to play a leading role in the golden age that gaming currently enjoys. Oktoberfest: a Beer and Pretzels game?